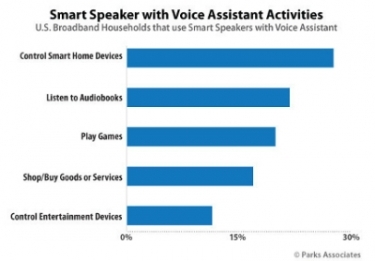 According to Parks Associates, U.S broadband households are starting to prefer using a smart speaker with built-in voice assistant tech to control smart home devices. Voice-based technologies have experienced massive growth in the past five years, according to Parks Associates. Research from Parks Associates finds 28 percent of U.S. broadband households with a smart speaker utilize a voice assistant to control a smart home device, compared to only 12 percent that use the device to control an entertainment device. The research firm analyzes the trends in smart home, connected entertainment and consumer-based IoT in State of the Market: Smart Home and Connected Entertainment, available for download on the Parks Associates site. “The entertainment ecosystem is lagging a bit in the voice control area, even though 45 percent of U.S. broadband households see voice control of the TV as appealing,” says Jennifer Kent, Director, Research Quality & Product Development, Parks Associates. Voice-based technologies have experienced massive growth in the past five years, Kent continues, due in large part by alleviating complexity in the user experience and delivering key use cases in control of smart home devices. “As consumers see these voice solutions operate their smart lights and thermostats, their interests extend to their entertainment services, creating opportunities for players that can bring a quality voice-based solution to this ecosystem,” she explains. For more information about “State of the Market: Smart Home and Connected Entertainment” report, go here.